The following is based on a talk I gave with Devpacific last Thursday in Vanuatu. In a passage from his famous work The General Theory of Employment, Interest and Money, John Maynard Keynes presented a novel theory of how share prices are determined. Normally economists like to think of stock prices settling at an equilibrium level where supply and demand meet. The cost of shares is a fundamental property based on the present discounted value of a company’s future worth. But Keynes thought otherwise, likening stock market investment to a newspaper beauty competition in which the winner is the person who predicts the most popular woman in the contest. Players won’t win by saying who they think is the prettiest; if they’re rational they should try to predict others’ probable choices. Other entrants will, if behaving sensibly, do the same thing, basing their submissions on others’ likely entries. Excerpt From: Thomas Homer-Dixon. “The Upside of Down.” Knopf Canada, 2006. iBooks. I am not referring to the elites in the politburo of the CPC, the princelings, or those closely associated with the channels of power in the central kingdom. I am referring to the teeming masses who make the goods and provide the services that have made the aforementioned groups wealthy and powerful. For them, retirement isn’t what they expected it to be; the vast majority will grow old before their country grows rich enough to escape the middle-income trap and provide them the pension that they deserve after a life of toil and hardship. 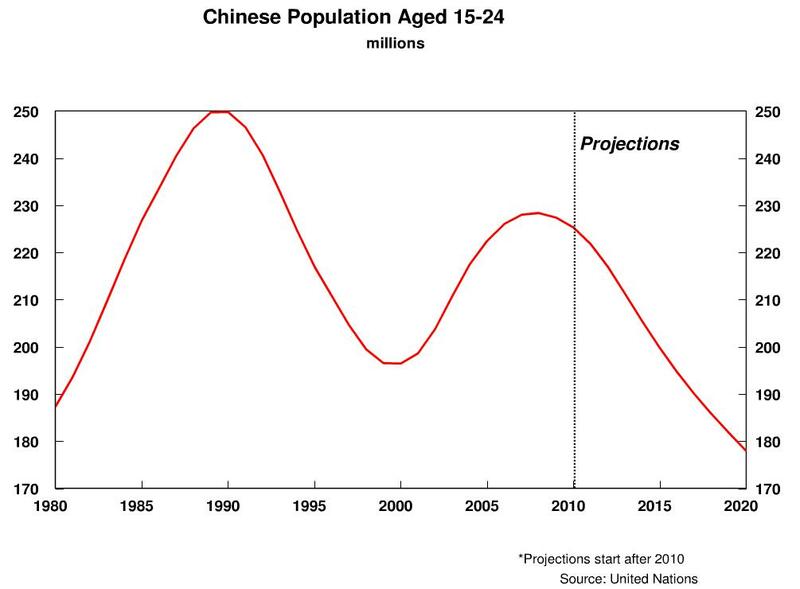 In his always informative blog, chindia-alert.org, Chiahou Zhang (Charles Chang) links to yesterday’s Bloomberg Businessweek piece: Forget About Retiring, China’s economic Planners Say. What if Chinese were required to work an extra five years, or even a decade, before retirement? There are growing calls among officials and academics in China to consider that controversial move as the country’s rapidly aging population puts new stress on its pension program. China must consider “deferred retirement,” said Hu Xiaoyi, a vice minister of human resources and social security, on Oct. 22, speaking to journalists at a seminar in Beijing. 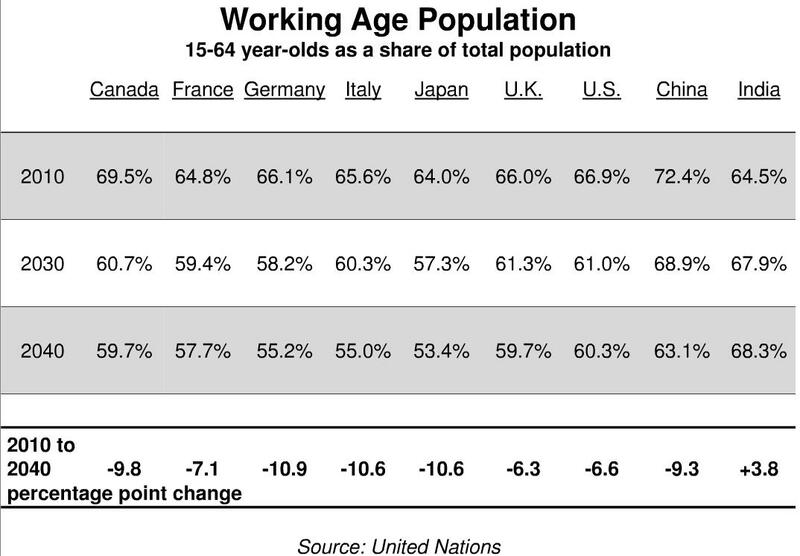 This won’t be made easier if one considers that current projections of Chinese population aged 15 to 24 (based on the nations’ current one child policy staying in place) sees a drop off in that cohort as well as the working age population. 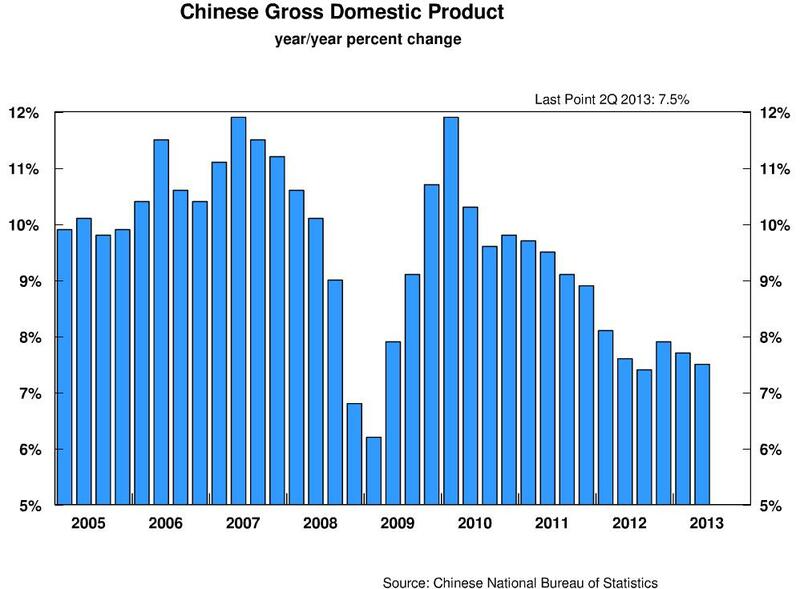 As I have stated previously (China won’t save the world) there are limits to China’s investment driven growth model although the amount of foreign exchange reserves and the surplus current account position permits the mandarins to pull the levers of fiscal stimulus again in order to spur growth. Meanwhile, as part of its desire to shift to a more consumption-driven economy, China is pushing an expansion of social welfare programs, expected to get a further boost at the upcoming Party Plenum meeting in November. 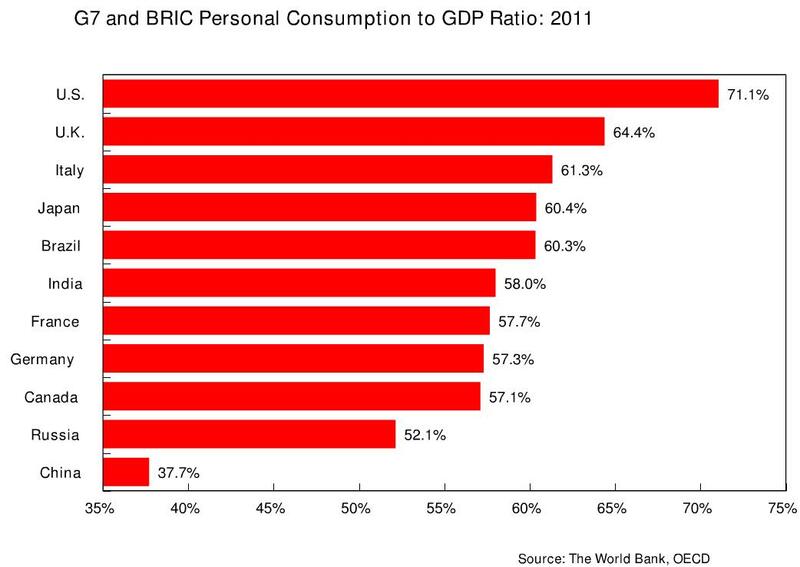 Today, the proportion of China’s economy made up by domestic consumption is only around 35 percent, about half the level in the U.S. The logic of a stronger social safety net: Chinese who worry less about the future, including meeting the cost of health care and post-retirement living expenses, will spend more now. 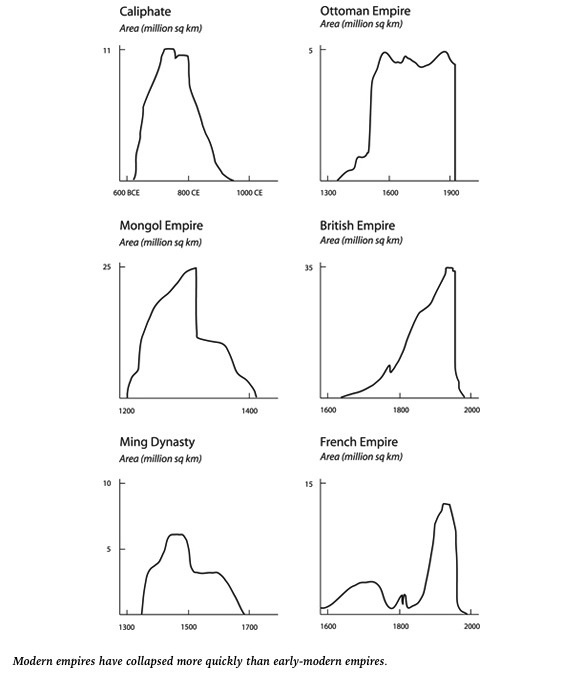 How is this going to be done in a global economic system that does not sufficently vacuum the current account surpluses –particularly from China and Germany — when the goods producing nations are export driven with a household sector that consumes relatively little when compared to the Unites States. (Go here to understand the concept of surplus recycling). Everything is interconnected. The recalcitrance of law makers in Washington adds to the confusion but also sets forward a more challenging path that will ensure greater hardship for the masses, be they in the savings prone east or the debt laden west. Charts from Gary Shiling’s deck during the CFA Society Toronto 56th Annual Forecast Dinner on Tuesday, October 1, 2013. Roberts, Dexter. “Forget About Retiring, China’s Economic Planners Say.” Bloomberg Businessweek, October 23, 2013. http://www.businessweek.com/articles/2013-10-23/forget-about-retiring-chinas-economic-planners-say(accessed October 24, 2013).